Fuhao, the first woman to appear in Chinese written history, commanded an army of 10,000 soldiers during the Shang dynasty. 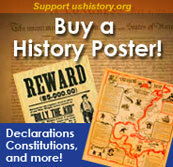 Recorded history in China begins with the Shang dynasty. Scholars today argue about when the dynasty began, with opinions ranging from the mid-18th to the mid-16th century B.C.E. Regardless of the dates, one event more than any other signaled the advent of the Shang dynasty — the Bronze Age. It was during the Shang dynasty that bronze working became common. Thousands of artifacts from the ruins of Yin, the last capital of the Shang, were unearthed in the late 1920s and '30s. Bronze vessels for drinking were used in ritual ceremonies, while bronze chariots and axes were used in battle. As the metal was associated with royalty, the tombs of Shang kings contained hundreds of small bronze objects, even including hairpins. One of the few undisturbed tombs was that of the legendary Fuhao, wife of Wu-ting. Her tomb by itself contained 468 works of bronze and 775 pieces of jade. Some of the bronze objects found contained the first Chinese characters ever written. Very simple in nature, these characters often represented the name of the object's owner. Oracles written on tortoise shells serve as the earliest evidence of the development of a writing system in China. In addition to bronze, examples of the early Chinese writing system can be found on oracle bones, another type of artifact characteristic to the Shang dynasty. Ancient Chinese priests commonly used tortoise shells and cattle bones to answer questions about the future. They interpreted the cracks formed by holes punched in the bones. Oracle bones also served as a way for the priests to write down the history of the dynasty and the timeline of kings. Today, over 150,000 oracle bones have been recovered. Unfortunately, many more artifacts containing early Chinese writing have been lost. Writing made on books of bamboo strips and silk could not survive centuries of burial in the earth. Many of those that did survive were burned by the first emperor of the Ch'in dynasty in approximately 100 B.C.E. From what has survived archaeologists and historians have learned much of the Shang culture. The Shang were skilled workers in bone, jade, ceramics, stone, wood, shells, and bronze, as proven by the discovery of shops found on the outskirts of excavated palaces. The people of the Shang dynasty lived off of the land, and as time passed, settled permanently on farms instead of wandering as nomads. 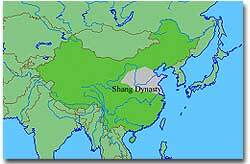 The Shang dynasty emerged in the 17th century B.C.E. as the first true Chinese dynasty. Its boundaries are shown in gray. To guard against flooding by the Yangtze and Yellow Rivers, the ancient Shang developed complex forms of irrigation and flood control. The farming of millet, wheat, rice, and barley crops provided the major sources of food, but hunting was not uncommon. Domesticated animals raised by the Shang included pigs, dogs, sheep, oxen, and even silkworms. Like many other ancient cultures, the Shang created a social pyramid, with the king at the top, followed by the military nobility, priests, merchants, and farmers. Burials were one way in which the social classes were distinguished. The elite were buried in elaborate pit tombs with various objects of wealth for a possible use in the afterlife. Even an elephant was found among the ruins of an ancient tomb. The people who built these tombs were sometimes buried alive with the dead royalty. The lesser classes were buried in pits of varying size based on status, while people of the lowest classes were sometimes even tossed down wells. All of the classes however had one thing in common — religion. The major philosophies to later shape China — Taoism, Confucianism, and Buddhism — had not yet been formed. Folk religion during the Shang dynasty was polytheistic, meaning the people worshipped many gods. This bronze sculpture of a human head with gold leaf is typical of the bronze artwork created during the Shang dynasty. Ancestor worship was also very important to the Shang. It was thought that the success of crops and the health and well being of people were based on the happiness of dead ancestors. If the ancestors of a family were pleased, life for that family would be prosperous. If the spirits were not pleased however, great tragedies could occur. In addition, the god worshipped by everyone during the Shang dynasty was Shang Ti, the "lord on high." 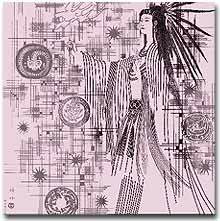 Shang Ti was believed to be the link between people and heavenly beings. The souls of ancestors, it was thought, visited with Shang Ti and received their instructions from him. It was therefore very important to make sure that Shang Ti was happy. This was done with various rituals and prayers, offerings, and sometimes even human sacrifices. The last king of the Shang dynasty, Shang Chou, was a cruel man known for his methods of torture. The dynasty had been weakened by repeated battles with nomads and rivaling tribes within China. Shang Chou was ousted by the rebel leader Wu-wang in 1111 B.C.E. According to Chinese sages, when dynasties fell, it was because they lost the moral right to rule given by Heaven. Read the Mandate of Heaven from the Shu Jing, composed during the Zhou dynasty but written as advice to the second Shang king. Check out the thought-provoking discussion questions at the bottom of this Brooklyn College Course website to see how well you grasp the material. According to Chinese legend, a man named Cangjie was inspired by the footprints of birds and animals and created written characters in imitation. Trace the developments of Chinese pictographs through their inscription on oracle bones, bronze, bamboo, and even silk at this well-organized website.